An 1893 rendering of the N.O. 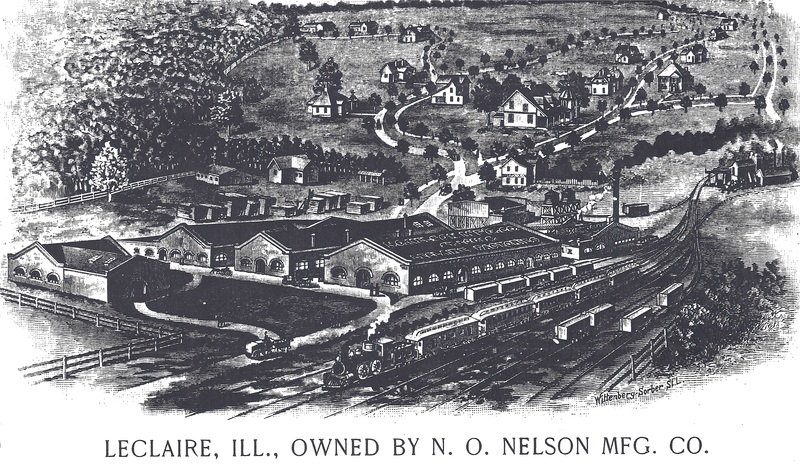 Nelson Manufacturing Company factory and Leclaire. (Source: N.O. Nelson Manufacturing Company Catalog, 1893). Listed in 1979, the Leclaire Historic District was one of Madison County, Illinois’ earliest large National Register districts. However, the early nomination was less than twelve pages long — making it insufficient to tell Leclaire’s rich story and to aid in the stewardship of resources in the district. The nomination included over 500 primary resources with no inventory of which resources even contributed to the district. In 2013, the Edwardsville Historic Preservation Commission obtained a Certified Local Government grant from the Illinois Historic Preservation Commission to create a new National Register nomination for the district. The Commission was frustrated by the lack of a reliable inventory, making its reviews of alterations in the district (which also has a local district status) very difficult. The Commission contracted Preservation Research Office to not only rewrite the nomination, but to undertake the district’s first architectural survey inclusive of both primary and secondary resources. PRO enjoyed the insight and guidance of both then-Commission chair Will Krause and historian Cindy Reinhardt, both residents of Leclaire. Edwardsville city planner Scott Hanson provided support for mapping. The final draft of the new nomination was 205 pages long, making it a thorough account that will guide cultural resources management decisions to come. The nomination not only presents Leclaire’s history but also the context of “company towns” like it across Illinois, showing that Leclaire has statewide significance. PRO Director Michael Allen supervised the project, with contributions from Lindsey Derrington, Susan Sheppard, Lydia Slocum and Olivia White. The Leclaire Historic District, a historic suburban village now located in Edwardsville, Illinois, possesses statewide significant and is eligible for listing in the National Register of Historic Places for Community Planning & Development. A thoughtfully planned and designed village founded on the progressive ideals of industrialist N.O. Nelson, Leclaire survived as an independent village until it was annexed by Edwardsville in 1934. In the late nineteenth century Nelson’s Nelson Manufacturing Company was one of the first companies in the United States to successfully implement a profit sharing program, and later initiate a program of cooperative ownership. The village of Leclaire was a physical extension of those social ideals of the cooperative movement. The Leclaire landscape remains a cohesive suburban landscape of mostly single-family residences and a large park with a lake. Renowned engineer and surveyor Julius Pitzman of St. Louis designed Leclaire’s original plat that set the suburban character with uniform set-backs, curvilinear streets and deed restrictions. Leclaire has very little demolition or alteration since it became a part of Edwardsville, although some infill construction has been built since then. The period of significance starts with the earliest construction in 1890 and ends with the village’s annexation into Edwardsville in 1934. 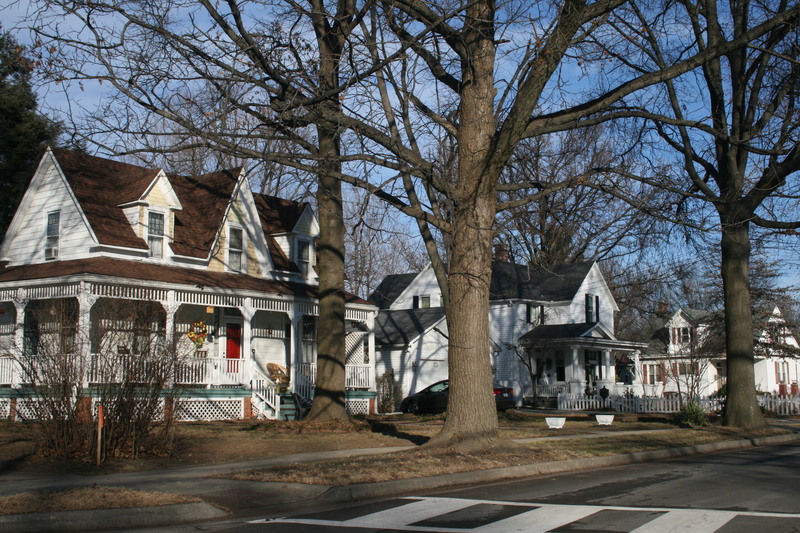 Houses on Jefferson Road in the district, January 2014. The Leclaire Historic District encompasses a 23-block area (200 acres) bounded by Madison Avenue and S Brown Avenue on the east; Hadley Avenue and the alley between McKinley Avenue and 1st Avenue on the south; the Madison County Nickel Plate Trail (or Rte. 159), Longfellow Avenue, and Leclaire Street on the west; and Wolf Street on the north. These streets formed the original boundaries of the village of Leclaire.